In The language of food, Stanford University professor and MacArthur Fellow Dan Jurafsky peels away the mysteries from the foods we think we know. Why do we eat toast for breakfast, and then toast to good health at dinner? What does the turkey we eat on Thanksgiving have to do with the country on the eastern Mediterranean? Can you figure out how much your dinner will cost by counting the words on the menu? The fascinating journey through The language of food uncovers a global atlas of culinary influences that lie just beneath the surface of our daily snacks, soups, and suppers. Did you know that ketchup, America’s national condiment, began as a fermented fish sauce from China’s Fujian province, and its linguistic origins are “ke” for fermented fish and “tchup” for sauce? Did you ever wonder why we eat toast for breakfast, but “toast” good health at dinner? Dan Jurafsky introduces us to the origins of some of our most beloved foods and culinary customs, shedding light on little-known facts and serving up the sort of trivia that is guaranteed to tickle the taste buds of foodies far and wide. Jurafsky’s delightful stories, delivered in the form of a menu, uncover an atlas of pre-modern culinary influence. 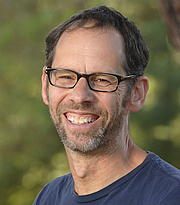 Dan Jurafsky is Professor of Linguistics and Professor of Computer Science at Stanford University. He is the recipient of a 2002 MacArthur Fellowship, is the co-author with Jim Martin of the widely-used textbook "Speech and Language Processing", and co-created with Chris Manning one of the first massively open online courses, Stanford's course in Natural Language Processing. Dan Jurafsky is currently considered a "single author." If one or more works are by a distinct, homonymous authors, go ahead and split the author. Dan Jurafsky is composed of 2 names. You can examine and separate out names.